Icing glazes are a quick and easy way to top pound cakes, cookies and scones. They are almost always just confectioner's (powdered) sugar and some liquid, such as water, milk, maple syrup or citrus juice. If a glaze is too thick, it may not coat the baked good correctly. Since confectioner's sugar is nothing more than granulated sugar that has been cut with cornstarch, adding more powdered sugar or a mixture of granulated sugar and cornstarch are the best options to thicken an icing. Slowly whisk additional confectioner's sugar into the glaze, 1 tbsp. at a time. Keep water on hand in case it gets too thick. Let the icing sit for a few minutes between additions of sugar, so as not to add too much. Cornstarch can also be added if the icing will not thicken. Put 1 cup granulated sugar in a food processor with 1 tbsp. cornstarch. Pulse until fluffy. As before, add this mixture 1 tbsp. at a time, whisking with each addition. 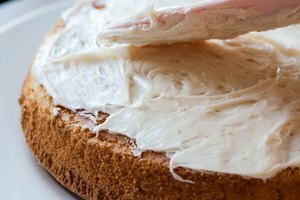 If the icing becomes too thick, add small amounts of water to thin it out. Never add cornstarch directly to the icing; it will clump. Chelsea Hall has been writing professionally since 2006. She was the food editor of a Holland, Mich., magazine for four years, contributed to "Traverse Magazine" and now works as a freelance writer. Hall graduated from Grand Valley State University, earning a B.A. in writing.